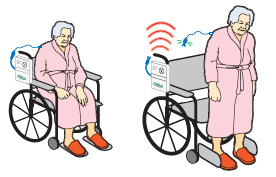 A smaller transfer board angled at one end to allow better positioning around the wheel of a wheelchair for side transfers. Unique low friction coating gives more slip and less grip. Rounded edges and radius corners provide a smooth and safe transfer for both client and carer. Available with or without grip on the underside. Hygienic; easily cleaned by wiping over with mild detergent or non-alcohol based disinfectant. Angled Transfer Board ( plywood) solid, no flex and light. for general transfer use. 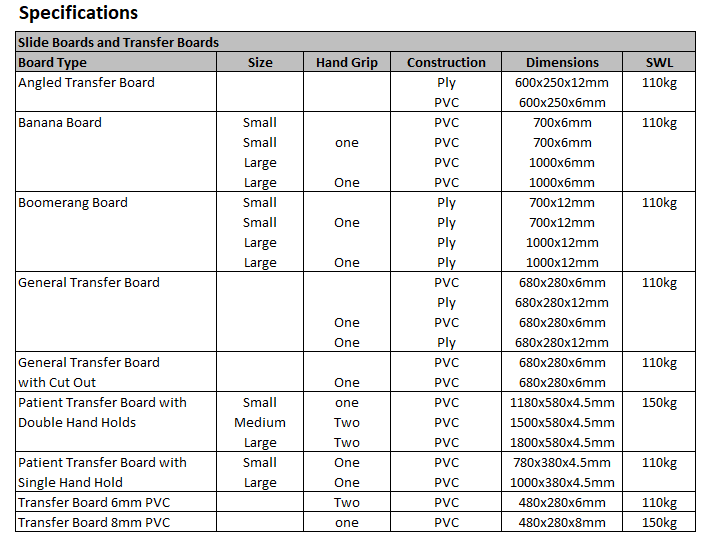 Angled Transfer Board ( P.V.C.) flexible construction for slight height variation. 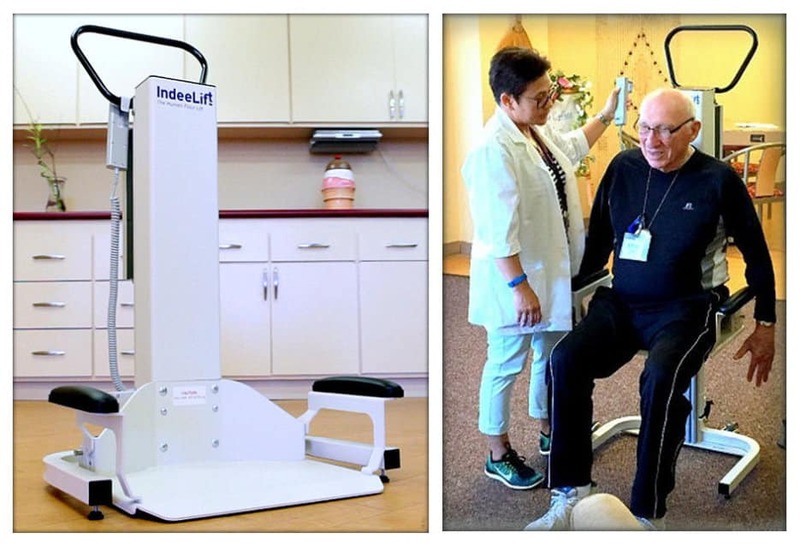 The Banana and Boomerang Board are used to transfer client from a vehicle seat to wheelchair, alleviating the need to lift. 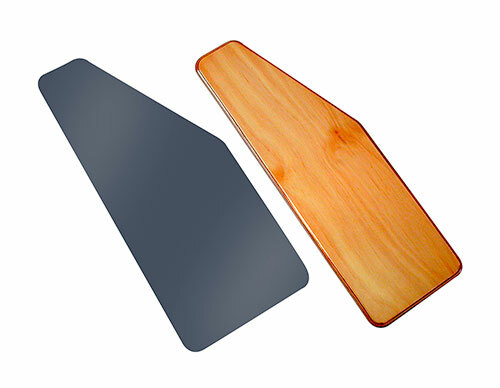 The Boomerang Board can be used to transfer into a vehicle also. The Banana Board is made of flexible P.V.C. and is therefore not as suitable for transferring client into a vehicle. Unique low friction coating gives more slip less grip. 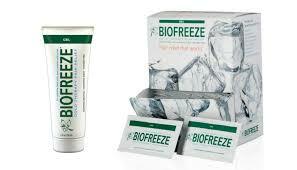 Hygienic; easily cleaned by wiping over with mild detergent or a non-alcohol based disinfectant. 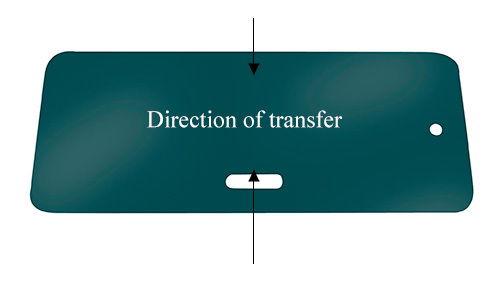 The General Transfer Board is used as a general transfer aid in a variety of transfer situations, ie, from bed to chair, chair to chair, chair to bed, etc. Unique low friction coating gives more slip less grip. 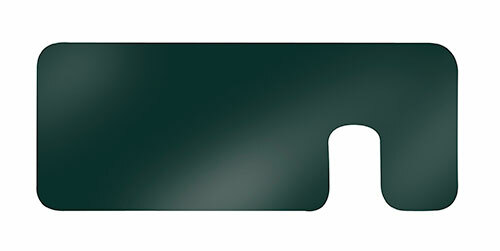 Rounded edges and radius corners provide a smooth and safe transfer for both client and carer. 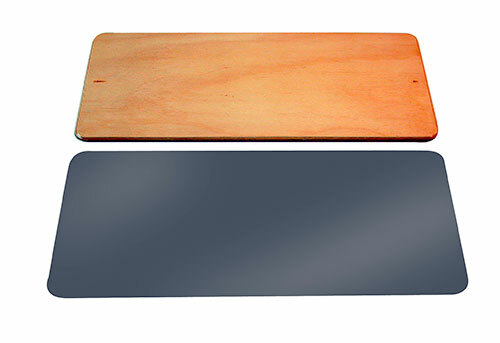 The Ply GTB is a stiff lightweight transfer board and is ideal in most situations. The P.V.C. GTB is a more flexible transfer board, ideal where there is slight height variation. Available with or without grip on the underside. Hygienic; easily cleaned by wiping over with mild detergent or a non-alcohol based disinfectant. The Patient Transfer Board (P.T.B.) 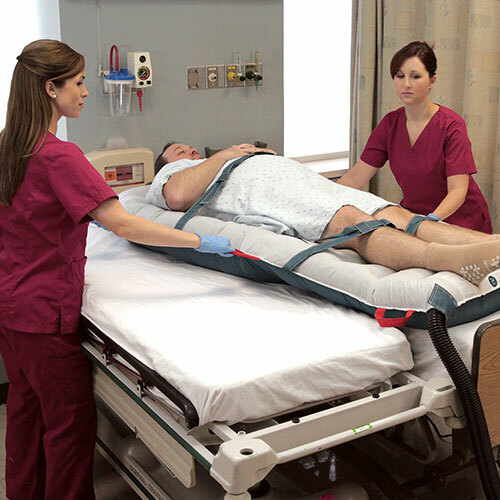 is used to transfer the recumbent client from bed to chair, chair to bed etc. 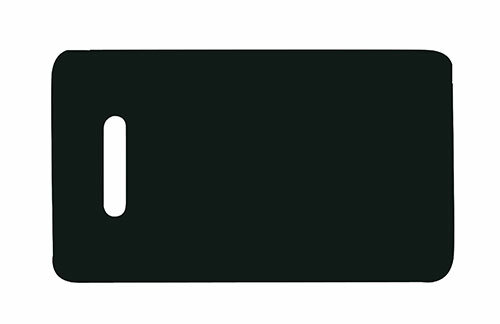 PTB is 4.5mm thick therefore quite flexible, making it ideal for small gap transfers with minor differences in height. Not suitable for wide gap transfers. Slide across width of board only. Constructed from a lightweight smooth resilient material, the P.T.B. is radiolucent. Hygienic: P.T.B. is easily cleaned by wiping over with a mild detergent or a non-alcohol based disinfectant. Two hand holes for carers use. Rounded edges and radius corners providing a smooth transfer for both client and carers. Underside features grip sections ensuring secure usage of P.T.B. P.T.B. is easily stored by hanging up using hole provided at top. The Patient Transfer Board (P.T.B.) is used to transfer the recumbent client from bed to barouche, barouche to bed etc. 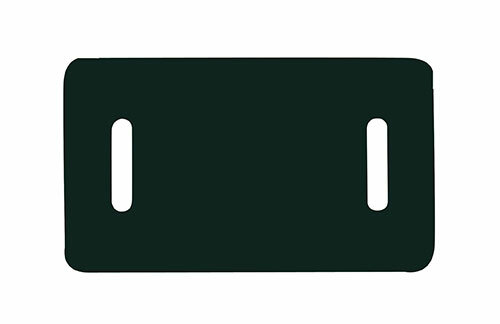 PTB is 4.5mm thick therefore quite flexible, making it ideal for small gap transfers with minor differences in height. Not suitable for wide gap transfers. Slide across width of board only. Constructed from a lightweight smooth resilient material. P.T.B. is radiolucent. Hygienic: P.T.B. is easily cleaned by wiping over with a mild detergent or a non-alcohol based disinfectant. One hand hole for cares use. Rounded edges and radius corners providing a smooth transfer for both client and carers. Underside features grip sections ensuring secure usage of P.T.B. 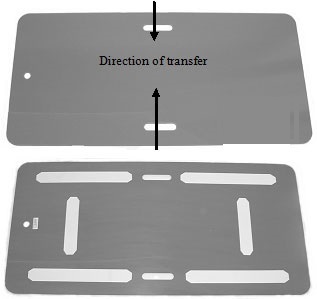 The 6mm Transfer Board, is used as a general transfer aid in a variety of transfer situations, ie, from bed to chair, chair to chair, chair to bed, etc. 6mm PVC creates stiffer board to reduce flexibility. Two hand holds for ease of handling. Rounded edges and radius corners provide a smooth and safe transfer for both client and carer. A Mid Flex board, ideal where there is slight height variation. 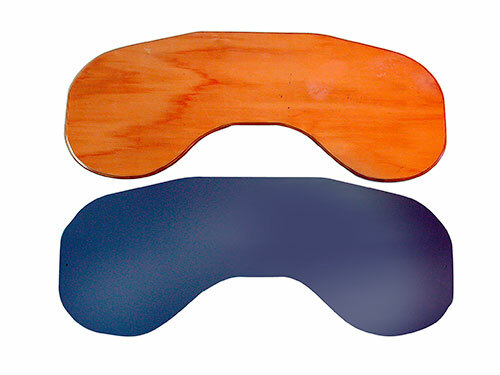 The 8mm Transfer Board, is used as a general transfer aid in a variety of transfer situations, ie, from bed to chair, chair to chair, chair to bed, etc. A stiff transfer board, ideal where there is slight height variation. 8mm PVC creates stiffer board to reduce flexibility. Single hand hold for ease of handling. Rounded edges and radius corners provide a smooth and safe transfer for both client and carer.